Nappanee residents may place brush at the curbside for pickup. Collections occur on Mondays, weather permitting, from March to October and by appointment in November. Piles must be manageable for one person. Also, Christmas trees will be collected when left at the curb. Leaf collection in the Fall takes place weekly. Residents living along SR 19 and US 6 are asked to bag their leaves for easier collection and to prevent road hazards. The City of Nappanee has a contract with a private company for trash collection; you can view the agreement and guidelines by clicking here. 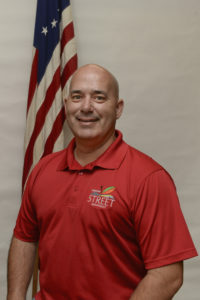 The street department does not provide trash removal service. If your pickup was missed or you have a question, please contact the clerk-treasurer’s office at 574-773-2112. In Winter, the street department is committed to clearing city streets efficiently. To accomplish this, the city is divided into quadrants for truck drivers to clear. We appreciate the understanding city residents have after significant snowfalls and we will attempt to clear out streets as safely and quickly as possible. For City residents, we provide wood products we have processed after brush cleanup. Mulch and chips are available on a first-come, first-served basis at our street department building on Wabash Street—due to demand, we cannot deliver these products. Depending on our annual city budget, Nappanee attempts to help homeowners and businesses repair broken sidewalks. The program is available on a first-come, first-served basis, and the property owner is required to pay only half of the repair cost. Please fill out the sidewalk application form below. We will measure the walk, obtain an estimate and schedule the work. Please note that the Sidewalk Assistance Program is closed for the season.